What is a Colorado Non-Disclosure Agreement? Colorado Non-Disclosure Agreement: What Is It? A non-disclosure agreement (NDA), also known as an NDA or a confidentiality agreement, is a contract that prevents one party from releasing secret information binds a recipient of secret information, including trade secrets or proprietary business information, to outside parties. 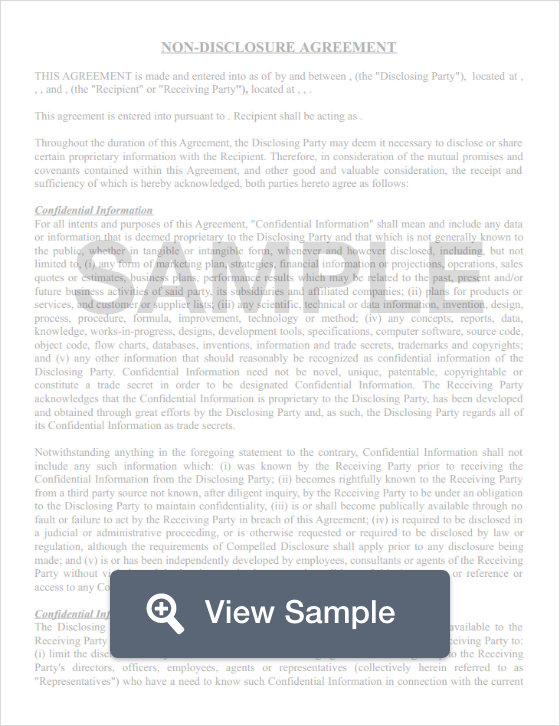 If the party violates the non disclosure agreement, they could be liable for damages. A non-compete agreement should often be used with an NDA to prevent a business or individual from performing competitive activities in the same industry. The State of Colorado has specific laws that govern both non-disclosure agreements and trade secrets. Protection of a trade secret is the most common reason that a business asks employees or independent contractors to sign an NDA. C.R.S. § 7-74 is known as the Uniform Trade Secrets Act. It covers the preservation of secrecy, the statute of limitations, and other important terms related to the NDA. In order for a Colorado NDA to be legally binding, it must comply with this Act. Colorado non-disclosure agreements are often used along with a non-compete agreement. A non-compete agreement is used to limit the sort of business the employee may enter into if they leave the company that asked them to sign the non-compete.